I was in the mood for latin food and my wife found this place while searching the internet. 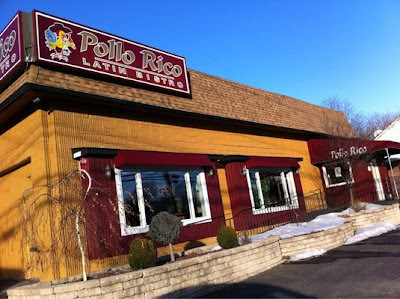 We had passed it a million times because my mother in law lives right down the road but we never thought to stop in there, thinking it was just some run of the mill latin place. We were wrong! Just checking out the menu on their website already had my mouth watering. When we arrived, we were immediately greeted. There is a waiting area as you walk in and the dining rooms are to the left. We were sat in the dining area adjacent the bar and a high chair was brought over for our daughter. We already knew what we wanted ahead of time, but we looked at the menu anyway. They have a little bit of everything from authentic latin comfort food to traditional american fare like hamburgers and buffalo wings. My wife ordered the beef brisket served in their 'special sauce' and she absolutely loved it. The portions are generous so she brought half home for lunch the next day. We ordered dessert but will most likely be ordering something different next time. My wife had the fried ice cream which was nothing special, and the flan I ordered was tough on the bottom, almost tasting burnt. Maybe next time. While we were dining we admired the latin themed decor in the room. The colors were warm and it had an overall comfortable feel to it. The music in the background was played at a perfect level to truly enjoy oneself. From the moment we arrived to the second we left, the staff was very attentive and friendly. My wife was apparently having an 'off' day. As we were about to walk out the door our waiter ran over to give us the bottle cap she had left on the table. She realized she left the whole bottle too so she went back to the table where the other staff was cleaning. They were cleaning the highchair and realized she left a toy attached so one of them ran after her again. They made sure we didn't leave anything behind. Any other restaurant would not have cared. Plus, not many restaurants clean up immediately after guests leave. Definitely a plus. No one wants a dirty table next to them while they're eating anyway. If you're looking for authentic latin food for a good price, this is a place to try!